This clone’s capability of being very floriferous is an understatement ! One of its culture awards reads: “Eight hundred sixty-seven flowers and 281 buds on 104 inflorescences…” a major WOW factor ! An impressive and famous cultivar bearing waxy buttery yellow flowers accented with a maroon blotch in its lip and bearing a wonderfully sweet fragrance. 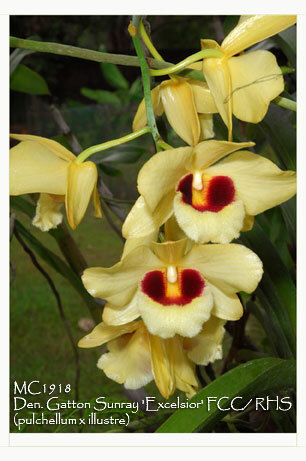 Easily grown under intermediate conditions, this temperature tolerant clone will readily grow outdoors with Cymbidiums. A May to June bloomer, we have only one division of this magnificent clone available. Very Highly Recommended !